HDMI, Component and Composite are all ways which Audio Visual playback equipment such as DVD and Blu Ray players, connect to Televisions and other peripheral display devices. As technology advances, new connection ports that deliver better performance are added to these devices while older connections are phased out. None are more obvious than analogue connections being replaced by superior digital connections. For example, Composite and Component are analogue connections and will require more than one connection cable to deliver video and audio. HDMI is a digital connection, supporting a higher quality video and audio signal all connecting via just the one cable. For reference, HDMI will deliver the best quality image, while Component will deliver an excellent image, and Composite will deliver a good image. Have you just bought a 3D TV or do you need the ultimate in a high speed. high compatibility HDMI cable? 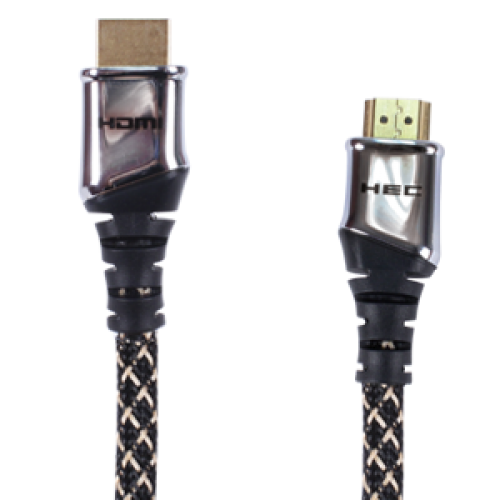 Well our new HDMI connect High Speed with Ethernet (version 1.4 compliant) cable will suit your needs. Certified and complaint with HDMI Ethernet channel, Audio Return Channel, 4K video resolution, additional colour space management and of course high speed 3D TV, this cable is 3M in length (longer lengths available on request), has a die cast metal plug and uses quality OFC copper. It is shield from interference by layers of aluminium, mylar, and copper foil. The external jacket is constructed of flexible PVC with a nylon braiding. We're so confident that our HDMI Connect cables will provide a lifetime of service that we offer a lifetime replacement warranty.